The 35.5 metre Azimut motor yacht listed for sale by Julien Solari at The World of Yachting (Formerly Thierry Voisin) has just had a €1 million price reduction. Built in GRP by Italian yard Azimut to a design by Stefano Righini with delivery in 2009, she is one of the yard’s popular 116 series. The interior by Carlo Galeazzi has accommodation for 10 guests in five well appointed cabins. These consist of a master suite on the main deck with two doubles and two twins below deck, all with satellite televisions, DVDs and en suite shower facilities. Privately used by the same owner since new, her twin MTU 16V 2000 engines have clocked up only 530 hours and cruise at 19 knots. The Azimut 116 is also ideal for al fresco entertaining and dining, featuring a large flybridge with a bar and bar stools, comfortable seating, sun pads and a television set. Further outdoor seating is available on the forward main deck. 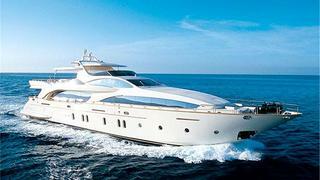 Available to view at the ECPY Opwn Day in Nice on April 19th, the Azimut 116 is now asking €4.85 million.